Enterprise Services Planning (ESP) with Kanban is a powerful method to align and synchronize various enterprise functions for a smooth flow of products and services across the Enterprise and to your Customers. Digité has partnered with David Anderson and LeanKanban, Inc. to build for Enterprise Services Planning (ESP) using SwiftKanban. SwiftKanban is a powerful, yet intuitive Kanban software that helps teams manage their Lean/ Agile initiatives. 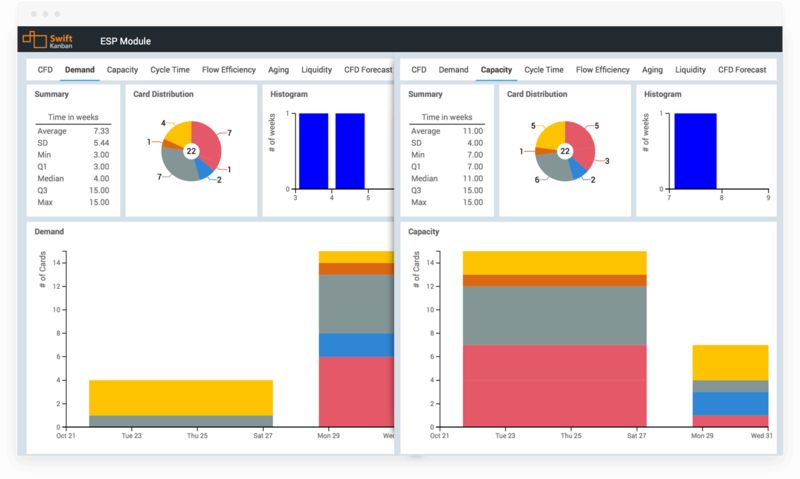 The SwiftESP module enables ESP features for teams using Kanban for Portfolio Management, Risk Assessment, Demand and Capability analysis and Forecasting Delivery based on Risk and Cost of Delay. What is my current demand? How can I analyze it? What is my current capability? What can I commit? What could be the cost of delaying a feature or a specific set of work items? When should I start working on a work item so I can say with 95% confidence it will be delivered by a certain date? How volatile is my demand? How fluid is my delivery system? What is the risk profile of various initiatives in my portfolio? Which ones should I select next for execution? 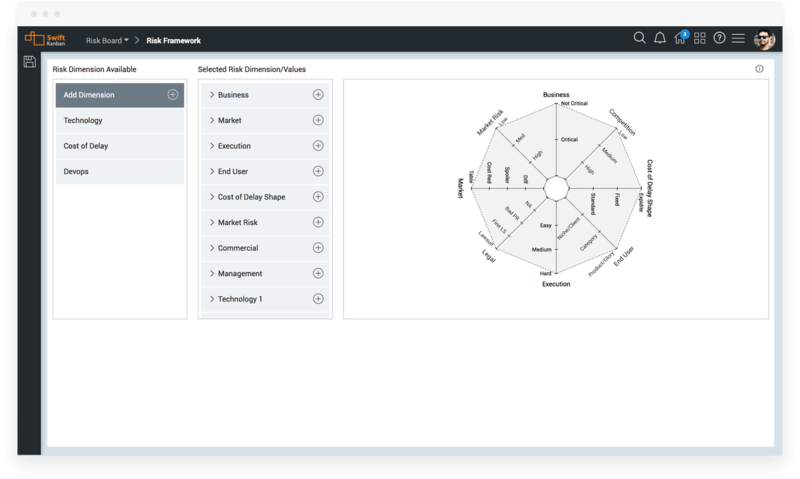 SwiftKanban provides the capability to define a Risk Assessment Framework, where you can define your Risk Dimensions and the values associated with each Dimension. The risk framework is defined at the Kanban Board level. Once you define the framework, you can assess or define the risk profile for the relevant cards on the board. Cards may represent projects or new initiatives in a corporate portfolio, or epics in a release planning board or features in a product roadmap board. Risk assessment might be done at a regular cadence and the risk profile of cards directly modified to match the latest assessment. Based on the risk profile of the various cards, you can then filter out cards based on the capacity available, current business conditions and customer demand. You can use a Risk Profile filter to select cards that match the risk criteria and directly add them to the Kanban board for execution. 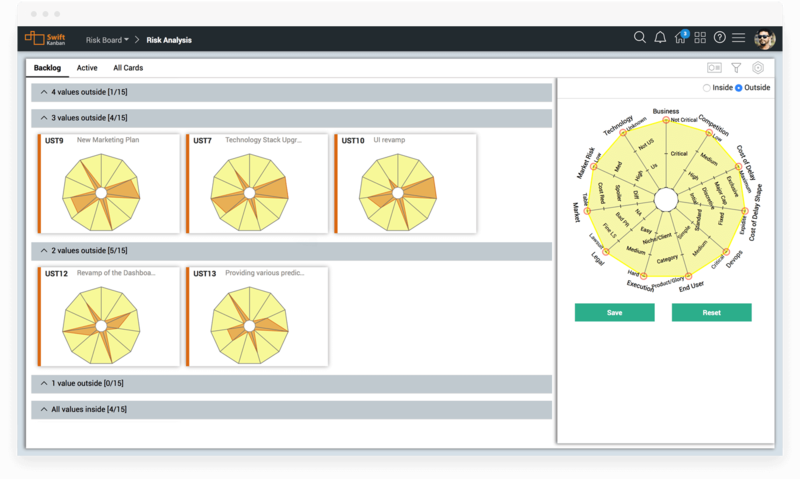 Using a user-selected data-set from the past, SwiftESP provides a detailed analysis of the incoming Demand and the outgoing deliver Capability of a business function or service, or an IT project or department, modeled and managed on a Kanban board. Using the temporal filter as well as other filters, you can do a detailed analysis of how high and smooth is the demand of incoming work (service requests or project requests); and for the same period, what the system capability was based on actual delivered products or services. 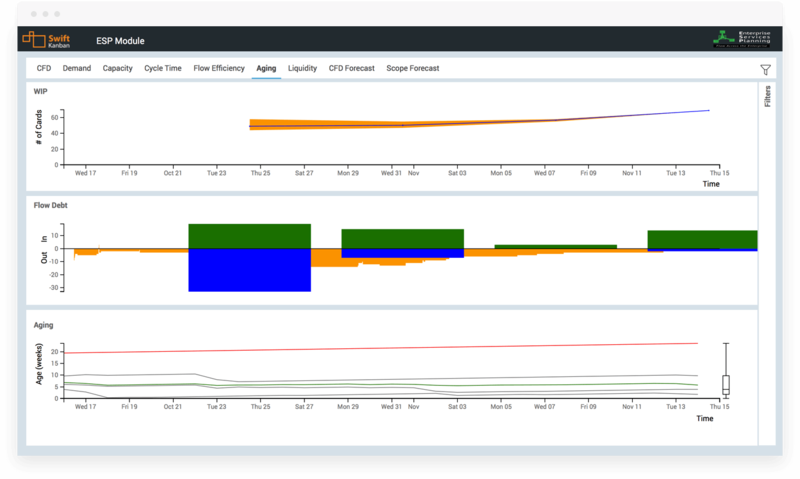 Using the same data set, you can also analyze the lead time performance and the flow-efficiency to study your system’s performance on those key delivery parameters. This analysis helps you make SLA commitments and help you analyze specific outliers in your dataset to ensure that you make commitments that you can deliver on. Both these forecasts use predictive modeling using the Monte Carlo simulation technique to provide you forecast at different confidence factors (or probability values). The Delivery forecast gives you a 30-day forecast of how much additional work could be completed in that time. 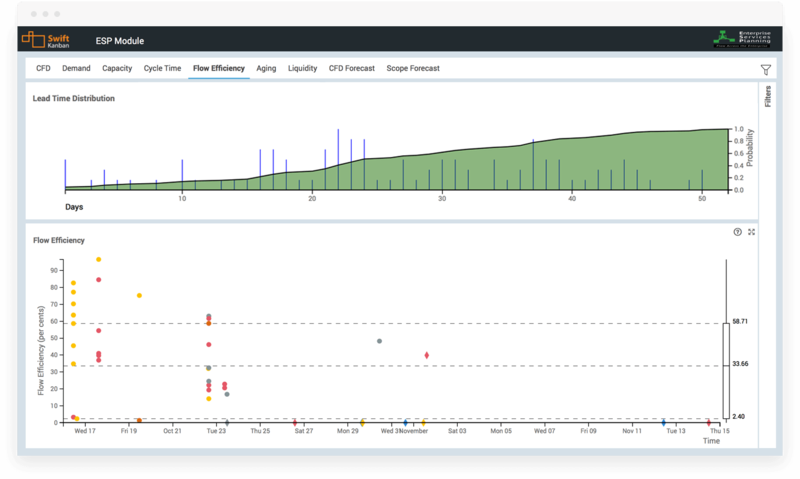 The Scope forecast lets you define the next deliverable and provides you a probability curve of likely completion times based on specific size of the deliverable. 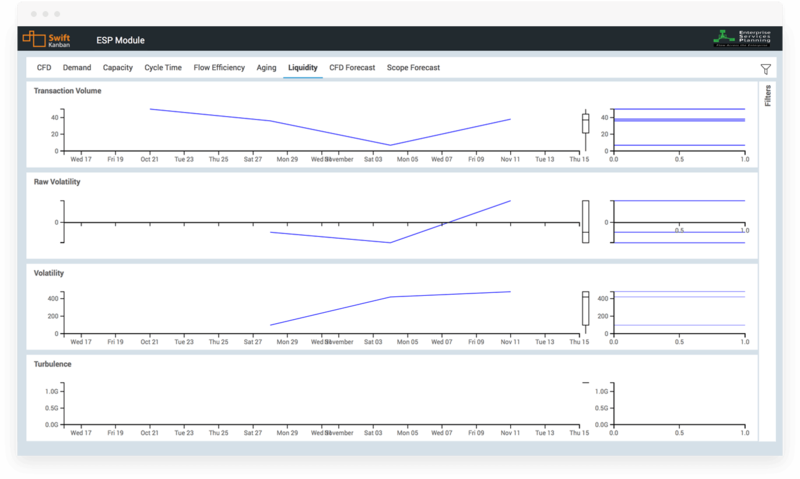 In addition, the Scope Forecast also gives you a Cost of Delay function that you can easily model. Based on that, and again using a Monte Carlo technique, it gives you the Estimated Cost due to delay in starting work on the proposed functionality. Kanban is all about Flow – and SwiftESP helps you understand how “fluid” is your Kanban system. It provides a Liquidiy metric – as well as an Aging metric. The first shows you how many valid “pulls’ made on the board, and shows you how volatile is that liquidity. The second shows you what is the average aging of cards on a board, thus providing another measure of a system’s flow. The greater the aging – and flow debt – of a board, the lower it’s fluidity and flow. SwiftKanban’s Enterprise License also provides a number of features that are covered by LKI’s Enterprise Services curriculum. 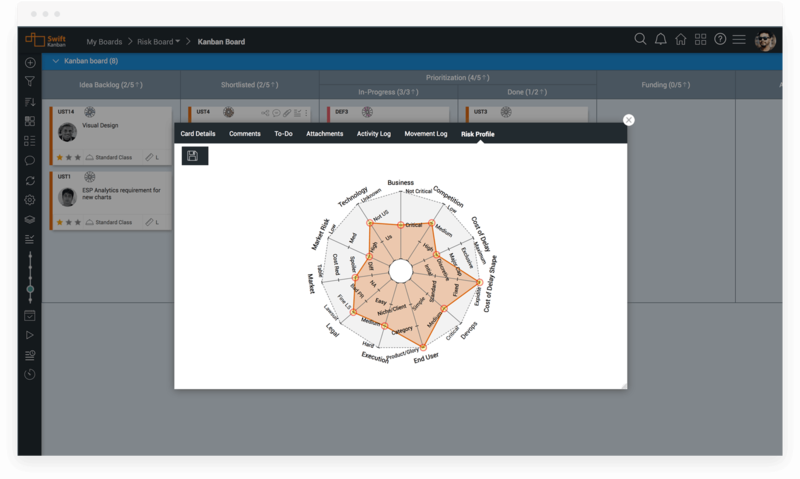 These include Portfolio Management (as also Card Hierarchy), Blocker Clustering, Upstream Kanban, and more. You can learn more about these features under our Enterprise Module license. Who can use the ESP Module with SwiftKanban? The ESP Module is invaluable to Senior Business or Delivery Line Managers who are involved in organizational and team level Demand and Capacity analysis, analyzing the overall risk to the organization and the cost of delay on critical services. It is critical for Portfolio Managers who are making Keep-or-Kill (yes or no) decisions on new or existing projects and corporate initiatives. It is a great tool for program, project and team performance analysis for Senior Executives, PMO and Corporate Planning organizations. SwiftESP is available as an add-on module to the SwiftKanban Enterprise license. To learn more about SwiftESP, please contact us for a custom demo or visit our pricing page.